“ Wash, rinse, repeat.” I can’t even recall the origin of this phrase that I’ve heard so many times over the years. In the case of Hasbro, a more apt reworking might be: “recolor, repackage, release.” In the early days of the 25A era line it was stated that repaints and parts reuse were going to become common place as Hasbro worked to get the most “bang for the their buck” in terms of tooling and new parts. 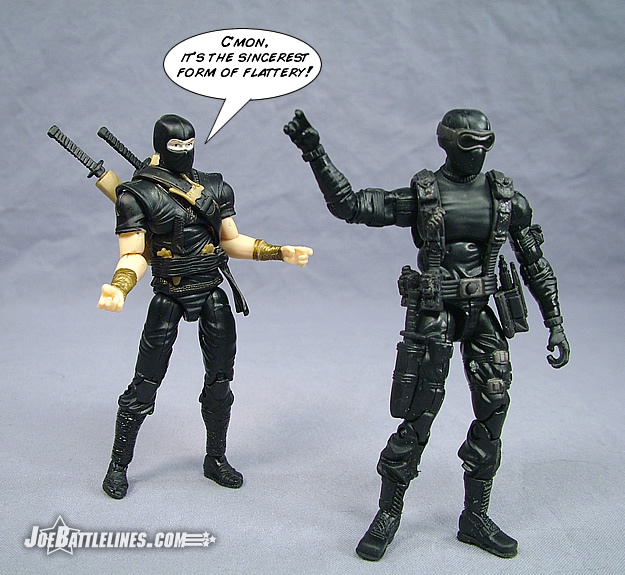 This meant that fans would be treated to a series of repaint of molds such as the ones used for the Cobra Trooper, Duke, and Snake Eyes v1; given the semi generic nature of each of these character designs this seemed like a reasonable practice. However, I don’t think anyone was truly prepared for just how many times Hasbro would find a new way to re-release the Storm Shadow v1 mold. Just off of the top of my head I can count five variations (technically six) uses of the mold that have already hit stores. In keeping with the current practice, the “Ninja-Ku Leader” makes number seven. This is one of those times where its honestly hard to review something objectively. Once Justin and I get caught up with the Toys R Us five packs this figure will have been reviewed seven times. 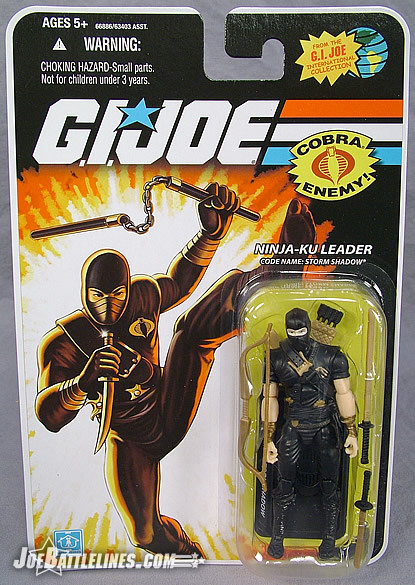 (Cobra battle pack #1, Cobra Legions battle pack, Comic Pack #21, Storm Shadow v2, Red Ninja, TRU Red Ninja, TRU Red Ninja Leader) It’s time to try and move past my personal malaise for a figure that I once thought was pretty interesting and find something to say. For this latest repaint, the crew in Pawtucket decided to dip in to the barrel of international repaints and borrowed the color scheme of the Argentinian Ninja-Ku. 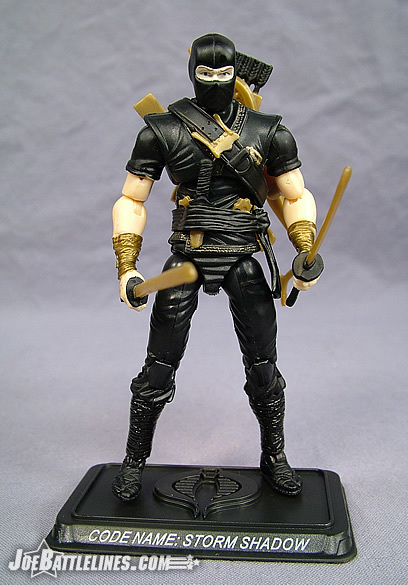 (http://www.yojoe.com/action/int/argblackcobra.shtml) In many ways, this color scheme is that of a more traditional ninja—clad entirely in black with the only elements of color found on the figure added from his gear and his wrist wraps. It’s a very dark and stealthy approach in terms of costuming and one that I’m surprised has never been released in the United States until now. The only color found on the figure (aside from the flesh tones of exposed skin) are the portions of the figure’s knife blades, molded throwing stars, wrist wraps, bow, and daisho blades which are colored in gold. 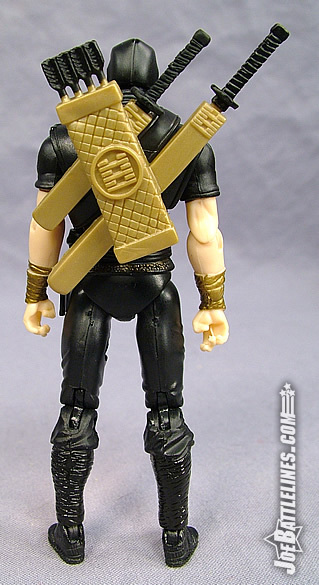 (Seriously, this is like looking at Auric Goldfinger’s personal ninja. Apparently things with Oddjob just didn’t work out after all.) 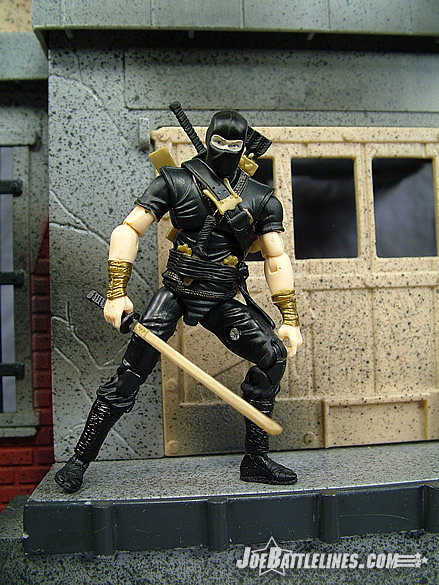 In other words, this is a ninja dressed in black and there’s just not much to say about that. I find the release of this figure a bit ironic. 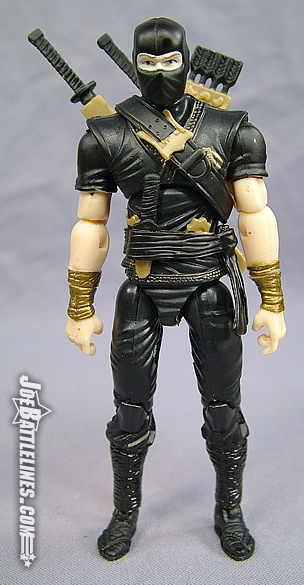 Hasbro went to the trouble to call him the “Ninja-Ku Leader” and yet offers no explanation of what this means. The file card on the back of the card is a previously released Storm Shadow card which makes not mention of “Ninja-Ku”. 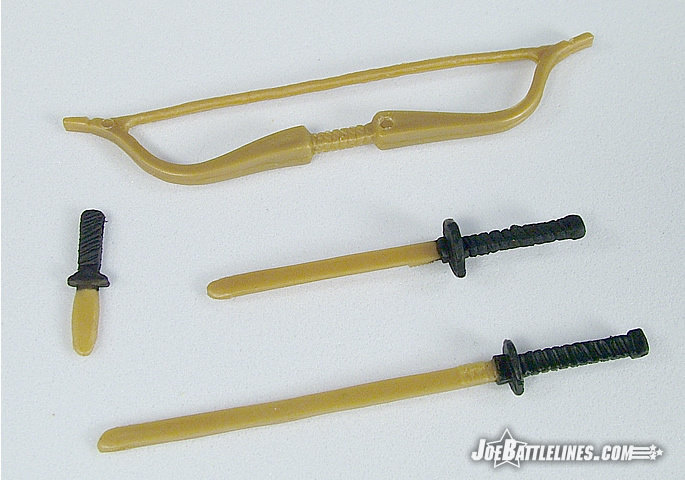 According to what I read over on YoJoe.com, “Ninja-Ku” was the character’s name not the moniker of any sort of faction or organization. 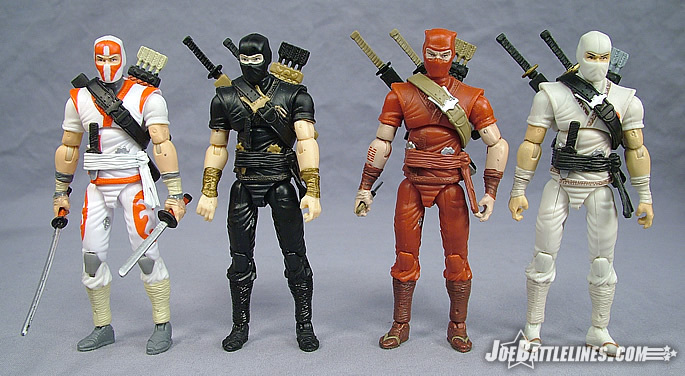 So, is Storm Shadow the leader of yet another ninja clan or is he an “army of one”? This really isn’t a bit deal in the grand scheme of things—I simply feel that Hasbro missed an opportunity here to educate fans about the international versions of old and familiar characters. Why not write up a new file card and make this a brand new character? New card artwork was already produced for the front of the packaging so how difficult would it have been to have one of their copy writers sit down, do a little web research, and write up a bio about a Cobra operative/ assassin from Argentina? 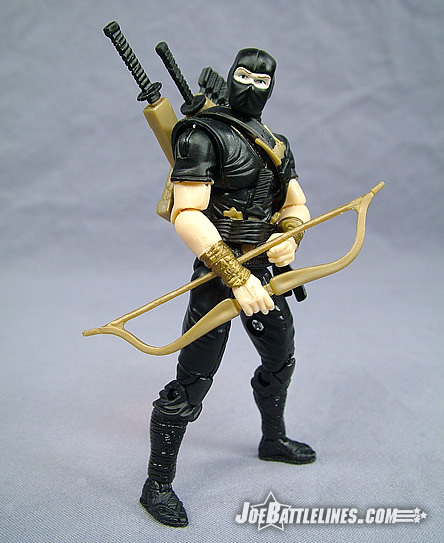 By doing so, the folks in Pawtucket might have succeeded in building up a little more excitement about this figure rather than leaving many fans with the perception that it’s “just another Storm Shadow”. 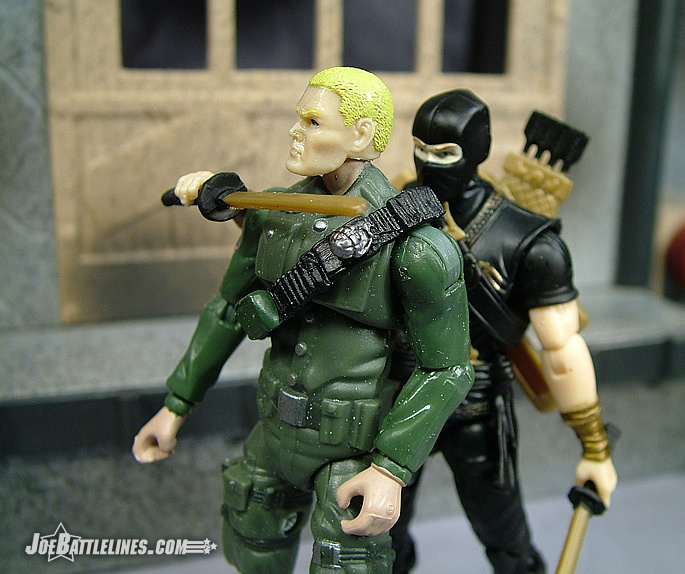 In fact, Hasbro could do this with a variety of the international repaints including the oft-clamored for Cobra D’Aco and Cobra Mortal. However, that's just my opinion-- take it as you will. If this review sounded like I was going through the motions it’s because there really isn’t much to say about this figure that hasn’t been said already. Aside from the color scheme this is the same Storm Shadow that fans have seen numerous times up to this point in the line. With no new accessories or a new back story to help breathe life into this figure I find that my malaise for this mold is growing by leaps and bounds. 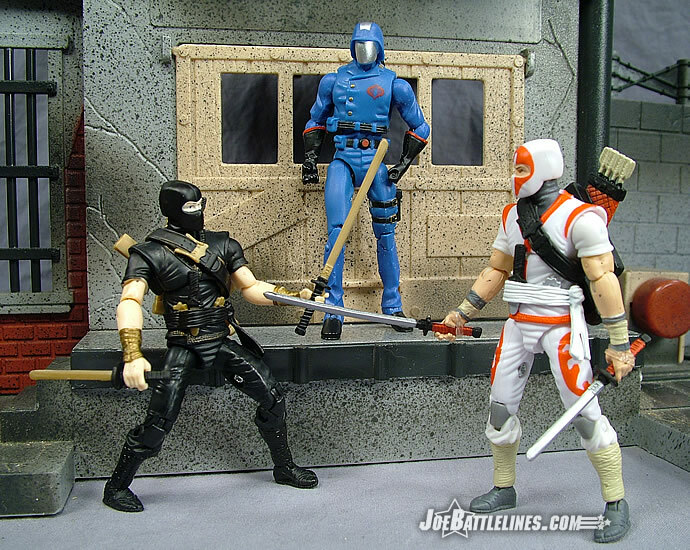 While the black is more appropriate to a ninja steeped in the mystic arts of invisibility and stealth, it’s just hard to get excited about the fact that Storm Shadow shared a load of laundry with Snake Eyes and ended up dying his uniform a darker shade. (Never mix lights and darks in the washer, Tommy! Let this be a lesson to you!) I’ve never taken much of an interest in the international repaints of many of the classic ARAH characters so without an new bio or description, this figure just doesn’t grab me. If there is a figure that can be safely skipped by most folks in this wave, Ninja-Ku leader is the one to pass up.